New mobility, the mobility of the future is being significantly shaped by innovations from Saxony-Anhalt. New process and production technologies are being developed and implemented here in close cooperation between universities, research institutes, toolmakers and mechanical engineers, and automobile suppliers. Materials are being optimised, manufacturing processes made more efficient, and production flows improved. The new technologies are applied in enterprises in Saxony-Anhalt or established in companies around the world via technology transfer. There is a 50-year history of aluminium production at the Novelis site in Nachterstedt. 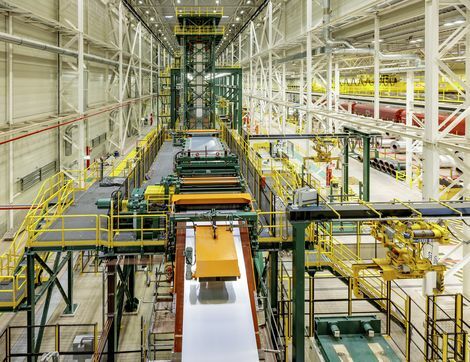 With a current workforce of around 1,150 Novelis employees, aluminium rolled products are manufactured here, and since 2014 the world’s largest recycling plant for aluminium has also been operating at this location. Innovative solutions for lightweight car body construction with aluminium are created in the group’s Research and Development Department in the Swiss city of Sierre. Automobile manufacturers are demanding sustainable, safe, light and energy-efficient multi-material concepts for the future. One new development at Novelis is a remotely laser-weldable alloy that makes possible an increased welding speed and greater flexibility. The key element in the manufacturing of the alloy is the process technology Novelis FusionTM, a continuous casting technology, patented by Novelis, in which several different alloy layers are simultaneously cast in a single aluminium ingot possessing one core and two outer layers. After solidification it is rolled into sheet, which combines unusually versatile attributes such as strength, corrosion resistance, and surface finish. With its innovative and flexible process technology in the areas of crushing, scrap sorting, decorating, and melting, the recycling plant is unique within the Novelis group and will act as a model for future facilities around the world. These aspects form an important basis for the “Closed Loop Principle”, closed production cycles which are conceived in cooperation with customers in the automobile industry. Aluminium scrap from vehicle production is collected and is melted down, cast, and rolled into aluminium sheet by Novelis. This avoids the emission of large quantities of CO2 into the atmosphere. The world’s second biggest producer of side shafts, the Japanese NTN Corporation, operates one of three European production sites in Gardelegen in the north of Saxony-Anhalt. NTN Antriebstechnik GmbH, founded in 2002 as IFA Antriebstechnik GmbH and since 2017 a 100-percent subsidiary of the Japanese NTN Corporation, produces fixed joints, profile shafts, VL joints and side shafts for German and international automobile manufacturers. Weight, efficiency factor, and angulation are decisive parameters for drive shafts. Although the development department is based in Japan, the processes are optimised as much as possible in Gardelegen. “When it comes to drive shafts, it’s more a question of evolution than revolution”, explains Guido Steffen, Managing Director of NTN Antriebstechnik GmbH. “What gives our production a competitive advantage, however, are the optimised processes and flows.” Due to coordinated linking of the machinery and a high degree of automation, production takes place almost independently, from the raw material to the packaged product. Humans are here primarily responsible for supervision of the production flow. “Our machines are sometimes equipped with measuring technology and check themselves”, says Steffen. “This enables us to deliver consistent, very high quality.” With a new order for the production of drive shafts in electrical vehicles, NTN can render a further contribution to the mobility of the future, appropriate to the self-perception as the New Technology Network (NTN). In order to secure the competitiveness of the companies through advantages in technology, there is close networking of business and science in Saxony-Anhalt. For example, the Otto von Guericke University Magdeburg, Magdeburg-Stendal University of Applied Sciences, and IFA Holding GmbH from Haldensleben developed an innovative friction welding process for the automobile industry in joint research projects. As a global supplier of joints and drive shafts, the IFA Group uses its proximity to the region’s scientific institutions with its own research department at the Haldensleben site. Innovative solutions are thus created in both process technology and process development.